The type of behavior that presents the greatest potential for scientific study, I find, is that which is exhibited under duress. Not enough research has been undertaken in this area, and those who engage in it do so under a dark cloud of superstition and mistrust, suffering a woeful lack of support from the public. We have to do it all ourselves – all of it – hidden away like criminals. Against completely nonsensical prejudices, I should add, held by a species composed almost solely of unexamined habits and chiseled thoughts, a species whose worldview has been set since childhood, with room for nothing new or exciting, and to whom the suggestion that there might be something worthwhile to be found on the edges is so repulsive as to be anathema to the trembling cores of their very moral fiber. Take the extinction burst, for example. While most people – including a few scientists, even – believe that certain behavioral patterns cannot be forcibly deteriorated, I am of the opinion that we simply have not developed the correct methodology. Everything can eventually be exposed; expulsed; exterminated. But lifelong habits run deep, and the development of an all-encompassing methodological framework that can demonstrably break even the most stringent of these remains, unfortunately, beyond my abilities. I'm still fencing with the problem; working on the edges, trying to find a way in. An extinction burst is not the extinction of a species, though that would be a marvel to engineer. It has to do with the more granular exhibition of learned behavior, when that behavior is met by adverse conditions never before experienced, and with the reactions subsequently exhibited by the afflicted organism. In most cases these new conditions progressively alter and eliminate that behavioral pattern, but you'd be amazed at how desperately some animals will maintain their old habits before finally letting them die off for good. This is, quite honestly, a good thing for evolution. I have no time for a species that gives up the first time it encounters failure, or pain, or lack of reward. Some species do give up right away. But others will persist, following through on the same pattern even when it is not being rewarded, or even, I should say, when the situation might demand that they break the habit. They may no longer be safe. There may be a dearth of food, or water, or air. They may be running out of time. But still they'll cling on to what might be called, for the lack of a better term, hope. Moreover, their attempts will intensify, the number of attempts rapidly increasing for a short period of time in a last-gasp attempt to maintain the pattern. That is the extinction burst. We see this occur in various guises throughout the animal kingdom, but it has not been extensively studied. This lack of research surprised me when I first began looking into the phenomenon; I did not expect my experiments to be groundbreaking merely by dint of being the first ones performed in a proper, thorough, scientific manner. Naturally, I've tried to cast a wide net, acquiring a set of vastly unlike species in New Eden and, under controlled conditions, carefully noting their reactions to my stimuli. Most learned patterns have to do with confinement, but I've never been entirely comfortable with the usual button-stimulus paradigm. All it really does is produce a lot of needy, overweight rodents. Instead – and believe me, this took a bit of time – I've set up a kind of working, monitored environment. Not just a cage with a bed and a feeder, but an actual maze of sorts. It's complete with all manner of stimulus-providing machinery, most of which remains hidden until the animal makes its way down that particular corridor or into that particular room. The function of the stimulus machinery is basic and easily understood by whatever animal I've got in the maze - often no more than the familiar button or sensory panel dispensing a quick drink of water or a brief encouragement of some gland or another. It does not constitute the main experiment, but it's extremely handy for taking more detailed measurements of the subjects' current extinction burst status. The main experiment is the maze itself. Most of the corridors and rooms have exits, but they are hidden and will reveal themselves only after a specific sequence of events has been enacted. Again, these events are not too complex for most of the animals in the maze, though I will admit that I was rather disappointed initially by the Hanging Long-Limbs, - but they do require the subject to experiment rigorously with materials at hand. The maze starts off easy but gets progressively more difficult. Along the way, as noted, stimulus-providing machinery permits me to monitor the subjects' extinction progress. Some tend to give up quite a bit sooner than others, and every time they stop to push a button in a room, you can see the hopelessness in their increasingly lackluster reactions to the stimuli. The Hanging Long-Limbs, of course, remain the exception. When animals come to in my maze – I'll admit I have to sedate them for transport and preparation, but it wears off without any noticeable effect – they tend to pace about a bit, get familiar with their surroundings, and altogether look a little confused but inquisitive. Not quite so for the Hanging Long-Limb. I don't quite know what causes this. The species has quite a limited spread, confined as it is to the methane clouds of a single Gallente planet. It grew up in an environment that has remained unchanged for hundreds, if not thousands, of years, almost entirely unspoiled by man. It has its predators, as everything does, but it knows how to deal with them, and nothing in my maze sets off any of its ingrained warning signals. The Hanging Long-Limb is also not, I have to say, a very intelligent species. This is not necessarily a drawback: Low intelligence often means highly developed instincts and makes an animal's responses easier to predict, categorize and quantify. Lastly, it does not rush into anything. It is a fast animal when it wants to be, as various small amphibians have learned to their brief regret, but unless driven by the impetus of moveable prey or by a nearby predator, it simply is not in any great rush at all. I had not considered this when I acquired these animals for my maze. They were costly – I had to flood the damn maze with methane, too – but they are worth it. While other species all follow more or less the same behavioral patterns, the Hanging Long-Limb continues to defy my expectations. It moves slowly, dazedly, as if drugged, and it seems to take an endless fascination in studying its surroundings. Many of them never even make it out of the first room. Watching their progress, once the observer has cultivated the necessary patience, is so lulling as to be practically meditative. The same cannot be said for another of my favorite subjects, the animal known to its local population as a Charisoco. It is a small rodent, nimble but extremely strong for its size, and restlessly inventive. It is invariably curious when it begins to explore the maze, shuffling around the corridors with apparent aimlessness, but even then, my observations have proven that it develops – visually develops –- its escape methods by making its way through the twisty corridors with remarkable alacrity. 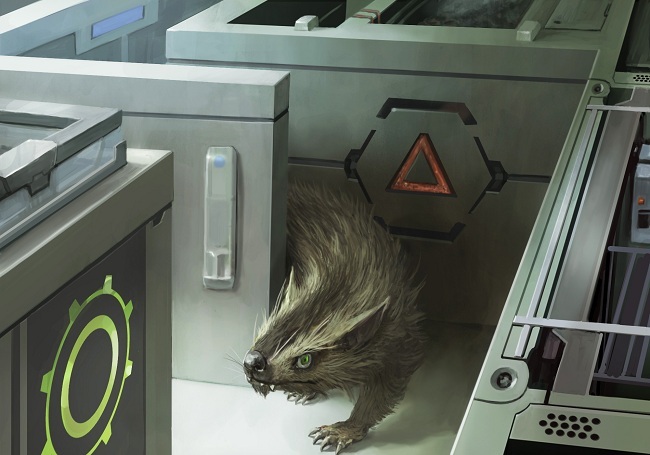 The first half of the maze provides little to no obstacle to this ingenious little animal, which makes its tendencies to halt its progress and experiment with the side-track stimuli I've left in various rooms all the more amusing to monitor. Meanwhile, the great beast they call the Slaver – easily one of the most dangerous animals I've put in the maze, and certainly one that made me nervous to the point of queasiness when I first watched it wander the corridors – has a more forthright approach. It is cunning, as predators are, but if it gets too frustrated it will eventually begin throwing itself against the walls, heedlessly ramming its bulk against them in a futile but impressive display of strength that rattles the room. The Slaver is a harsh and brutal animal that simply does not ever give up, though whether its tenacity is out of survival instinct or a kind of angry desperation, I don't yet know. None of which helps prove the extinction burst, as these animals make their way through my labyrinthine passages. At least, it remains unproven until they get to a random room – I don't even know which one; my maze autoselects it – where no solution will work. None. The exit strategy, which becomes obvious after a little while, does not function. No matter which panels, buttons, floor plates, or decorative items are touched, in whatever order, nothing happens. The real, proper exit strategy...well, that's when some of the animals start to get a little nervous. I've run this experiment countless times. I truly feel I am on the cusp of great discoveries here. But moreover, I simply enjoy watching these animals, my favorite subjects. I don't feel I'll ever tire of them, though I do fear that some day I will inevitably grow weary of the experiments themselves, and I'll have to put an end to it all. Yes, even the Hanging-Long Limb, reposed in blissful quiet; or the creative little Charisoco; or the restless, pacing Slaver. And maybe even you, my darling, as I watch you screaming at the walls.